Home Savings on Wilshire in Santa Monica: Love it or Hate it? Millard Sheets Studio, Home Savings branch at 2600 Wilshire, Santa Monica, 1970. Image thanks to Pete Leonard. It’s a busy time of year, but I noticed that I have not posted about the iconic Home Savings branch at 2600 Wilshire in Santa Monica — one of the best known and, depending on who you are, loved/hated branches. Do you love it? You have lots of company — it is routinely the first branch mentioned to me, especially by LA Westsiders. And so discussions about other Sheets Studio work in Santa Monica and the lost Denis O’Connor-Sue Hertel mosaic that was on the Third Street Promenade tends to start with a glowing conversation about this branch. John Edward Svenson, Girl Riding Dolphin sculpture, Santa Monica, 1970. Image thanks to Pete Leonard. 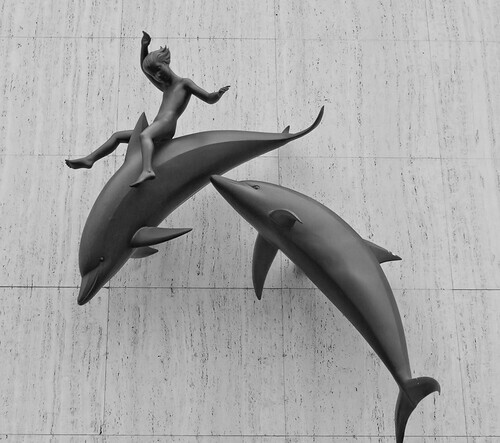 John Edward Svenson has a soft spot for the sculpture of the girl riding the dolphin, over the parking lot door; his daughter served as the model. And the Ahmansons seem to as well: in a visit to the Ahmanson Foundation offices, I saw the small maquette of this sculpture prominently displayed. But what if you hate it? Some love the Richard Ellis family group in front; others don’t understand the connection. Most who dislike the building focus on the mosaic, disliking the fabrication, by Denis, Sue, and others on a team led by Nancy Colbath – especially of the sunbathing youth (probably a girl and a boy, but because it is hard to tell, that adds to the grumbling). Sheets Studio, “Pleasures Along the Beach” mosaic, Santa Monica, 1970, detail. Image courtesy of Pete Leonard. Interviewer Paul Karlstrom: I know the one, for instance, on Wilshire Boulevard in Santa Monica. I used to live right nearby. That’s I think at 25th or around there. Sheets: I think that’s one of the poorer buildings. Sheets: Now that’s my feeling. I always felt that I. . . . I didn’t like the way that one’s _____ was done. Even more critiques from Sheets about this locale appear in a UCLA oral history. Just a reminder that the best artists can use their aesthetic sense to criticize problem art and architecture — even when it is their own. Thanks to my colleague Pete Leonard for the images. Stay tuned for more about changes to the blog and more work on the book version ahead in 2013. It is worth noting that Millard Sheets thought the mosaic was just too big to be effective, and perhaps he didn’t like the details of the design. But it has always been a popular favorite, and the sculptures and stained glass, front and back, are superb. 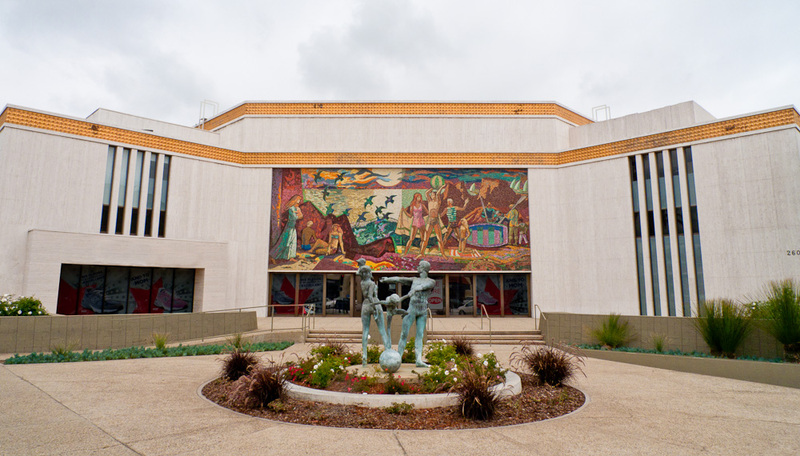 Tonight I heard the city of Santa Monica signed an agreement to let it be torn down, and the artwork saved and donated; this will be the second of two Home Savings that the city will allow to be torn down, and the city will be poorer for losing it. “I am speaking on behalf of the Santa Monica Conservancy Board which continues to exercise its mission as a public advocate for historic preservation. This includes urging you to keep in mind due process for the Landmark Home Savings building, which has architectural and cultural significance to the development of Santa Monica and the Southern California region.